The Fernbank Science Center offers one of the most diverse collections of learning and exploring opportunities—for tourists and locals alike—in one place than I've seen in quite some time. From life on Earth to exploration of the Universe, its offerings include dinosaurs, spacecraft, live animals, a library, a protected forest, a planetarium, and an observatory, just to name a few resources. As a tourist, one of the best things about the Fernbank Science Center is that the great majority of its resources are free! The only part that necessitates pulling out the billfold is the planetarium, but even that is only a third of the cost of a regular movie ticket. My recent visit to Fernbank Science Center streamed over two days. 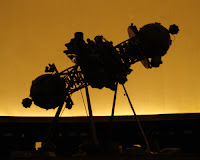 The first day I went to the Fernbank Planetarium for a show, "The Many Faces of Hubble," and then to the Fernbank Observatory for a look at the night sky. The second day, I returned to the planetarium for a different show and toured the exhibit hall and Fernbank Forest. The planetarium offers shows that change with the seasons and a regularly scheduled "In the Sky Tonight" Saturday morning program, which delves into which stars and constellations are visible in the current night sky. The Saturday program is at 11 a.m. with no shows in December. On my Saturday morning visit, our astronomer took us, virtually, to New Zealand to show us their night sky. It was illuminating that in fact New Zealanders see stars that we never see in Atlanta. And of course there are a few stars that we in Atlanta see that our counterparts on the other side of the planet can only view if they visit us, unless they have an equally generous planetarium host. The Fernbank Observatory is also free. It's open to the public on clear Thursday and Friday nights at dark. My visit started at approximately 9:00 p.m. The Cassegrain reflector telescope is so strong that we were able to see Jupiter's multiple bands of orange, beige and white, as well as the largest four of its 60-plus moons: Ganymede, Callisto, Io and Europa. I found myself unable to constrain a verbal, "This is so cool!" My excitement wasn't at all that of the geek that I know I can sometimes be. It was more a feeling of uniqueness…knowing that at that point in time I became member of a small portion of our planet’s population that has seen a celestial body so clearly and closely. It totally rocked! 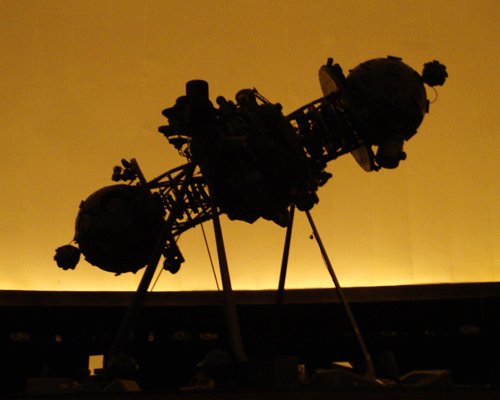 I'll share more about the Fernbank Observatory in an upcoming post. The greeter at the Fernbank Science Center is the skeletal head of a Tyrannosaurus Rex. While he's not so forthcoming with tour information and show times, he is a prime example of the fine specimens with whom he shares the exhibit hall. Each of the exhibits in the main hall is understated, meaning simply that their modesty allows the Center to pack a lot of information into a single, relatively small museum. While modest in size, the exhibits are rich in information. Continuing past the T-Rex and his entourage of a few other prehistoric creatures one ventures into a land peppered with animals that we see today—some are taxidermy specimens and some of them are living animals! The most fascinating, I thought, was the honey bee exhibit. There's a honeycomb, inside a plexiglass display, to showcase the amazing architectural feats of these buzzing creatures. But that's not all. In the corner of the animal section of the exhibit hall, there's a display with "curtains" covering each side of what looks like a sign undergoing renovation. When you pull back the curtain, you see hundreds, if not thousands, of bees busily making honey. I've never seen an indoor beehive, so that was a unique experience…and I almost missed it! While I was there, one of the staff scientists stopped by to perform a routine check. Had I not noticed what he was doing (his protective clothing piqued my interest), I might have missed the opportunity to see what was "behind the curtain." 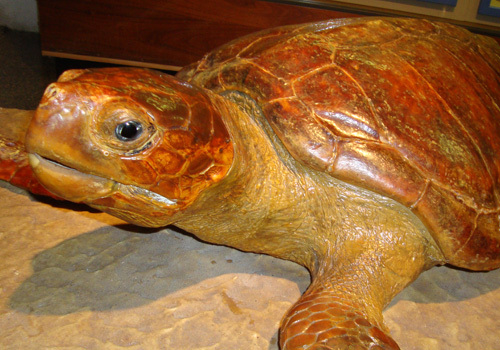 Other live animals on exhibit include a tarantula, various snakes, and poison dart frogs with bright blue and yellow coloring. There are a few other animals as well and even more in the Fernbank Forest. 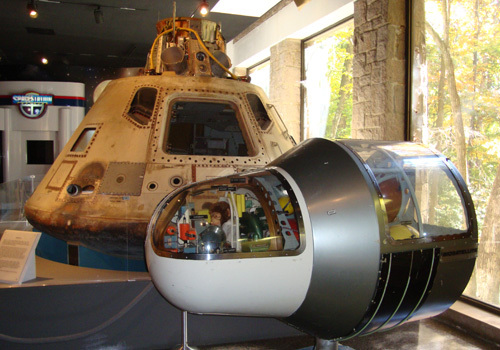 Going well beyond the confines of Earth's gravity, the Center has a number of exhibits relative to space exploration, including an Apollo 6 command capsule. One of the planetary exhibits is a child-size model of Mars. The space collection features quite a few meteoroids and a fairly large meteor, welcoming touching hands. I was very impressed with the number of parents and grandparents who brought their children to the Fernbank Science Center, not only on a sightseeing adventure, but to teach them about the diverse worlds of science and discovery. There were some who were serving as a tour host and then there were others who determinedly spent lots of time with their kids at the learning stations soaking in the experience and engaging them in dialogue. And gauging by the kids' attentiveness, and expanding craniums I'm sure, I wouldn't be surprised to one day learn that I was in the presence of a future scientist. To get to the Fernbank Forest you exit at the back of the building, near the honey bee exhibit. Immediately outside, you have the opportunity to explore several experiments and horticultural exhibits, including one on composting. The grounds are covered with bird feeders and, while I was there, lots of birds were taking advantage of the offer of food and shelter. 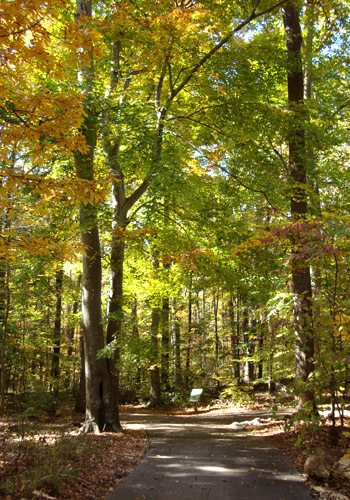 Fernbank Forest is a 65-acre expanse of protected land that is, in accordance with the mission of Fernbank, primarily to educate. The curving paths lead visitors on a botanical adventure. Around every bend of the Forest pathways are many species of animals. I encountered avian creatures of many colors and sizes, butterflies, and dozens of squirrels. Other noted Forest residents include owls, chipmunks, frogs and snakes (it's recommended that visitors stay on the trail), as well as the occasional opossum, raccoon and mink. I had not realized how pleasant and remarkably beautiful the Forest would be. I also had thought that I’d missed the colorful evidence trees display when they're preparing for the colder months. The reds, oranges, and yellows, mixed with the greens and browns, made the Forest seem incredibly alive, even as it prepares for its winter nap. Be sure to keep an eye out for the various species of fern, one of which is the Rattlesnake Fern, the Center's logo. As relaxing as the Forest was, its 1.5 miles of meandering paths also serve as a pleasant little jaunt of exercise. The Fernbank Science Center is part of the Dekalb County School System. The Center is more than I've described here…a lot more. You can learn about the Center's history and offering on its website or at the Center itself. So, am I satiated with science? 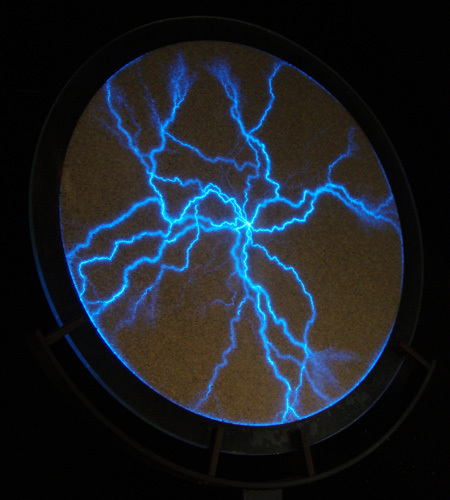 Although it took me two days to tour Fernbank Science Center, there's so much more to explore. And each season will present a new experience walking through the Fernbank Forest, learning through a new exhibit, or watching the night sky. I'll definitely be back. Great post! Has the City of Atlanta commissioned you to write a guidebook to Atlanta yet? Someone needs to harness your enthusiasm, and quick!